The market for yachts is concentrated around southern, eastern and northern China with the southern region accounting for the largest share. China is counted among the major yacht manufacturing countries of the world and is witnessing an increase in the number of yacht manufacturing units, which can be attributed to the low cost of production in the country. The cost of manufacturing yachts in China is 20-30% lower than European and North American countries. Several foreign players are now manufacturing yachts in China to lower their costs of production. Kingship Marine and Yantai Raffles are some of the key foreign players having manufacturing facilities in China. The increasing number of high net worth individuals in China is also contributing to the growth of luxury goods market. The demand for yachts in China is growing faster than the global average. The market for yachts is concentrated around southern, eastern and northern China with the southern region accounting for the largest share. Majority of the yacht manufacturers are located in Qingdao, Yantai, and Weihai in Shandong province and many of the foreign players are located in Shenzhen and Zhuhai. In China, the demand for small and medium size yachts is higher than large size yachts. Mid- size yachts have contributed the maximum to the growth of Chinese yacht market. The demand for super yachts in China is quite less, yet they account for a reasonable share in terms of value. The yacht industry in China also provides tremendous growth opportunities for other related industries, such as coatings, new materials, meters, and power & propulsion systems. The central and the local governments are encouraging the development of yacht industry to promote tourism. The regulations with respect to yacht registration, licensing and sailing were enacted in January 2009, prior to which there were no such regulations. 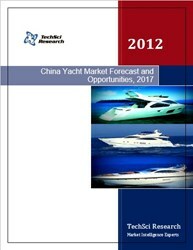 According to the recently published report of TechSci Research, “China Yacht Market Forecast & Opportunities, 2017”, the market is anticipated to grow at a CAGR of over 13% during 2012-2017. The market is witnessing the entry of new types of yachts, such as solar yachts and hybrid yachts that are expected to contribute to the growing market for yachts in China. The development of yacht clubs is also enhancing the industry’s potential as several yacht clubs and marinas are promoting yachting services. “Yachting is still a nascent sporting activity in China and it is expected that the development of more yacht clubs and marinas during the forecasted period would drive the market for yachts in China,” said Mr. Karan Chechi, Research Director with TechSci Research, a research based global management consulting firm. ‘China Yacht Market Forecast & Opportunities, 2017’ has evaluated the future growth potential of China yacht market and provides statistics and information on China’s yacht market structure, and the trends and opportunities in the yacht industry. The report includes segmental market projections and demand forecasting. The report is intended to provide cutting-edge market intelligence and help decision makers to take sound investment evaluation. Besides, the report also identifies and analyses the emerging trends along with essential drivers, challenges and opportunities available in China yacht market.